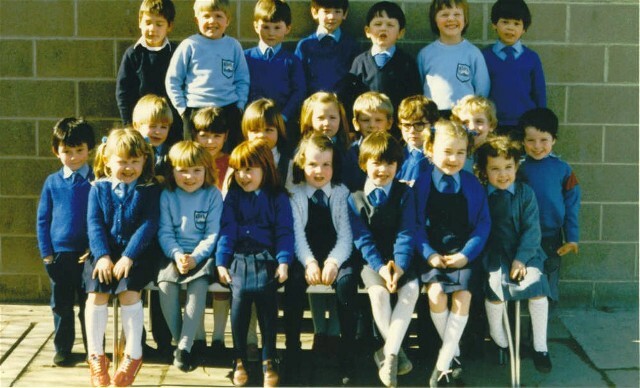 This is a photo of my (Emma O'Brien) class in P1 in Park Primary School approx 1984. Can you fix the year and put names to all these wonderful faces? Front Row (left to right): Karen Ross, ?? ?, Karen Russell, Lindsay Munro, ?? ?, Leanne Mullens, Emma Gallie. Front row (left to right): Steven Campbell (standing), Karen Ross, ?, Karen Russell, Lyndsey Munro, Nicola Reid, Leanne Mullins, Emma Gallie. The boy on the back row, 2nd from right, in between Paul Campbell and Jamie Macleod is Ben Bomant. I think the boy between Emma O'Brien and Lee Duncan (middle row) is Rodric ? (maybe ross) - his mum was the sewing teacher!!! Is the girl, front row, in between the two Jarens Suzie Sinclaire? The girl between the two Karens is Suzie Sinclaire. The girl between the two Karen's isn't me - sorry! Think it is Roderick and his surname is Macleod. His mum was indeed the sewing teacher. Beside Darren Geddis is Ryan Mackenzie. Between Paul Campbell and Jamie Macleod is Ben Beaumont I think? The girl in the front row, in between the two Karens, is me Shona Bethune.